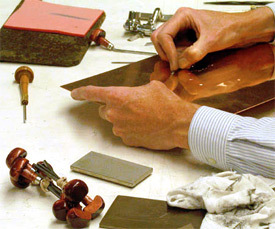 The technique of engraving on copper has been practiced since the fifteenth century. Of all the different forms of scraping, gouging, rocking, incising and etching the plate, none compare to the deliberate elegance of the aquatint. With the skilful use of acid and resin the engraver can create shadow, pick out light, and recreate the beauty of the original. In 19th century London Robert Havell was the acknowledged master of aquatint interpretation, producing work for some of the finest artists of the day. His gallery of natural history engravings was an essential stop for those interested in the rapidly expanding worlds of art and science. The Havell’s were a printing family. Robert had grown up surrounded by the trappings of the technical art. The heavy black inks, reams of handmade paper and stacks of weighty copperplates waiting to be incised and then passed through the heavy hand-operated presses, giving birth to innumerable impressions destined for the homes of collectors around the country. His son, Robert Jr., an equally talented engraver, had become estranged from his father yet continued in the family tradition through his freelance work. Although they would later collaborate in the greatest illustrated book ever produced, John James Audubon came late to his introduction to the Havell family. Contemporary descriptions of Audubon paint a picture of an extraordinary character. Dressed in the traditional clothing of his beloved Kentucky frontier, his hair slicked with bear grease. Loud and opinionated, he was a showman with a show. A giant portfolio of extraordinary watercolors depicting the Birds of America. Each magnificent in color and scale, meticulously researched and breathtakingly original. When Audubon arrived in Liverpool in the spring of 1826 his one goal was to find an engraver worthy and capable of creating copperplates from his watercolors. Fresh from his disappointing reception by the scientific and artistic establishments in Philadelphia, his spirits were low. However, this time he was armed with letters of introduction and, helped by his remarkable self-confidence, Audubon presented his art to the people of Liverpool. He and his watercolors were an instant success. Not only was the public impressed with his art, but the man himself became something of a society celebrity. Audubon’s thoughts now turned to the practicality of the publication. He struggled with the questions of production and sale. Although advised otherwise, Audubon had always envisaged his work to be printed “the size of life”. This presented many logistical problems. There were few engravers that might be willing to consider such a challenge, working with copperplates as large as 39 x 26 inches, an unheard of scale. As the fall of 1826 approached Audubon was made aware of the engraving talents of an Edinburgh based company headed by William Home Lizars. Having worked for Sir William Jardine and Prideaux John Selby, both noted scholars and natural history artists, Lizars was familiar with this style of illustration. Upon seeing Audubon’s watercolors for the first time he was enthusiastic. He quickly introduced Audubon to both Jardine and Selby. Audubon spent the first few days of his stay in Edinburgh visiting the Lizars workshops observing the engravers at work. He was impressed by their ability to faithfully transfer the images to the plate. All the time working in reverse, they preserved the character of the image before them and yet skillfully imparted their own interpretation. Dimension and texture are suggested with the simple black line, waiting for the addition of color by the watercolorists to complete the effect. Within a few weeks Audubon had reached an agreement with Lizars, and in November 1826, work began on the Birds of America. Lizars would engrave the cop-perplates and the images would be printed on the finest handmade paper produced by James Whatman. This paper would be oversized, measuring slightly more than 39 x 26 inches. In the paper trade this had become known as Double Elephant size, resembling the flapping ears of the Indian elephant. Lizars’ colorists would then apply watercolor to the finished engravings at Audubon’s direction. Edinburgh in November can be cold and dank. The driving rain and heavy dark afternoon skies are enough to depress the most enthusiastic citizen. However, it was on one late fall evening that Audubon dined with Lizars and, for the first time, saw a proof impression of the first completed plate, the Wild Turkey. How must he have felt! At last the long hours in the Kentucky forests had born fruit. While Audubon allowed himself some pleasure in this milestone, he also felt some foreboding and in one of his frequent letters home to his wife he described his concerns about the future of the project. He was closer to the truth than he imagined. With a production of such expense and complexity, Audubon understood that cash management had to be at the center of any plan. He decided that the Birds of America should be sold by subscription. With a potential price of $1000, it was unrealistic to expect many patrons simply to give him the full amount in advance. By dividing the publication into multiple “parts”, he could induce subscribers to pay on a monthly, or at least a regular, basis thus creating cash flow for the production and making it easier to contemplate for potential purchasers. With the potential for an adequate cash flow to ensure continuous production, Lizars also suggested other money saving ideas. The most important of which was to print only enough to fill demand. This was contrary to the habit of the day, which was to run as many prints as possible in advance. By the spring of 1827 Audubon was in possession of the completed first part. Armed with sets to show to potential subscribers, Audubon headed for London. Not only the wealthiest city in the world at this time, London was also the scientific heart of the growing field of natural history. Audubon knew that there was no place more important to his success than London and its educated and interested population. He had been in the city for less than two months when he received disquieting news from Edinburgh. News that would alter the Birds of America dramatically. Lizars’ colorists had gone on strike. After printing each impression was left to dry (the paper having been dampened prior to the press to allow it to take the ink from the plate more easily) and then handed to the colorists. Coloring engravings was a thankless, repetitive task. Much was expected for little reward. Both artist and printer demanded perfection from the colorists, and this led to tension and grievance. We can only specu-late at the conversations between Lizars and his colorists as the prints started coming off the presses. The prospect of years of repetitive labor with John Audubon continually looking over their shoulders was too much. The colorists demanded more money, and when it was not forthcoming, they went on strike. It is possible that Lizars looked to the future, his workforce and the possibility of failure and he lost confidence. This became a happy serendipity for Audubon although at the time it severely upset him. For Audubon was about to discover the beauty of Aquatint, the technique that was to give the Birds of America its extraordinary visual impact. While Audubon recovered from the shock of the news from Edinburgh, he set about finding a replacement for Lizars. Audubon had often admired the natural history engravings in the window of a gallery and printers by the name of Havell. He met with the elder Havell to discuss the possibility of transferring the project to their well-equipped and well-staffed workshops. Thus was born one of the great collaborations between artist and engraver of the 19th century. While the artist provides the image, the engraver contributes an enormous amount to the final product. Audubon’s original watercolors are bold and spectacular. They have the strength and vibrancy of the forests and wilderness that Audubon traveled. Havell’s interpretation of the images was more subtle. The engravings reproduced the boldness of the watercolors, but they now possessed a delicacy so admired by the collectors of the day. The Havell’s, and Robert Jr., in particular, worked tirelessly over the next eleven years, finally completing the Birds of America in 1838. A monument to the single-minded genius of Audubon, the Birds of America also represent the outstanding achievements of numerous engravers, colorists, paper makers and binders.